Dungeons? Alchemy? Catacombs? PSP? Yes, it's a new title from the folks at Atlus! They've just announced portable dungeon crawler Class of Heroes, coming this April to the PSP. 80 hours of dungeon crawling await you in Class of Heroes, an action RPG from Japan that manages to combine together all of the usual elements into on PSP-sized package. You have your adventuring academy, a flexible character creation system with more than 500 combinations of race, gender, alignment, and major field of study, and more than 75 maps worth of hacking, slashing and spell casting. On top of the action, Class of Heroes also contains an alchemy system with more than 400 recipes you can create using random items you stumble across, as well as the ability to upgrade your equipment to keep yourself ahead of the grading curve. Check out the press release for that charming wit we've come to expect from Atlus' PR department. IRVINE, CALIFORNIA - JANUARY 20, 2009 - Atlus U.S.A., Inc., the publisher with an honorary doctorate in Exploration and Monster Hunting, today announced that it has secured the North American publishing rights for Class of Heroes™ for PSP® system, a dungeon-crawling RPG in the great tradition of first-person adventures like Etrian Odyssey. Class is now in session; today's lesson? How to explore more than 75 levels of deadly catacombs, slay hundreds of varieties of vile monsters, master the intricate art of alchemy, and uncover over 1300 items, priceless treasures, and rare artifacts. And some arithmetic, at the very end. If there's time left. The characters you craft and those you choose to take with you into the dark, dreary depths may be the difference between walking out a hero, clutching prizes and riches beyond imagination, or being carried out a zero, your stiff fist still feebly clutching your sword. Mysterious dungeons await you, first-year. An early demise looms around every dark corner. Don't forget to finish your homework. Class of Heroes hits the books April 7, 2009 with an MSRP of $39.99. Long ago, without reason or explanation, the mysterious labyrinths came to be, and the world was changed forever. In a constant state of flux, they sprawl across the world like a web, connecting towns and villages, mountains, lakes, and deserts. Many adventurers delved into these labyrinths dreaming of riches, and those fortunate enough to return did so with amazing stories and unimaginable treasures. It was only natural that the children of the world began to look upon these heroes with unconditional admiration, eager to follow in their footsteps. And so, academies for adventurers were born. Particus Academy may not be the first such school, but we certainly endeavor to be the best! Here at Particus, we strive to equip young men and women with the tools they'll need to become full-fledged adventurers. Bravery, spellcraft, swordplay, 101 ways to avoid dying a horrible death... These and many other lessons and skills await prospective students! We hope your studies here are as enriching and productive as you've dreamed they would be. * Over 500 character possibilities - 10 races, 2 genders, 3 alignments, and 15 majors add up to incredible opportunity to customize your party! Change majors for further customization at higher levels. * 80 hours of classic dungeon crawling - This is as classic as dungeon crawling gets in an ever-changing 3-D labyrinth containing more than 75 maps full of puzzles, traps, and treasure. Battle hundreds of monster types and uncover over 1300 item types. * Flexible alchemy system - Offering more than 400 recipes, this system allows you to synthesize new items from random components found in the labyrinths, as well as customize your weapons' attributes, range, and strength. 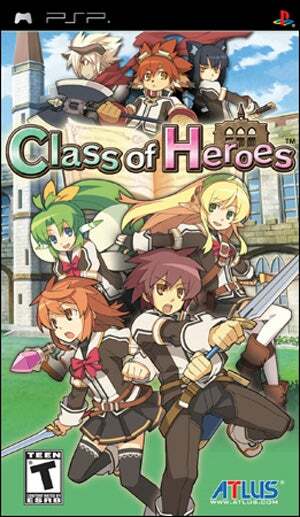 Class of Heroes has been rated "T" for Teen with Alcohol Reference, Mild Fantasy Violence, Mild Language, and Mild Suggestive Themes by the ESRB.